King Eadwyre was the ruler of Wayrest in the late Fourth and early Fifth Centuries of the Third Era. He was the husband of Queen Carolyna with whom he had a daughter, Elysana. Later in life, Eadwyre wed the Dunmer Queen Barenziah, and became stepfather to her children, Helseth and Morgiah. Together with Barenziah, Eadwyre plotted to bring about the downfall of Jagar Tharn when he learned the Imperial Battlemage was masquerading as the Emperor during the Imperial Simulacrum. In the years prior to the Warp in the West, he was known to be one of several factions which fought for possession of the Totem of Tiber Septim. Eadwyre died sometime between 3E 417 and 3E 427, and was succeeded by Queen Elysana. Ruler of Bangkorai, in High Rock, from the seat of his house in Evermore. His father, Duke Blaise Guimard, was a hero of the war against Durcorach the Black Drake, and was elevated to the throne after King Heseph died during the siege of Evermore. Eamond married Arzhela, a cousin of High King Emeric, and had two children, although they did not prove very popular with their subjects. In 2E 582, he caught wind of an amassing Imperial invasion, lead by Septima Tharn. Eamond gathered his troops at Bangkorai Garrison and mounted a defense against the Seventh Legion, ultimately perishing in the fight, along with his only son. Youngest son of Uriel Septim VII and Caula Voria. There were rumors that he and his brothers were actually doppelgangers placed in the palace by Jagar Tharn during the Imperial Simulacrum. He was murdered by Mythic Dawn agents at the age of 53, in a coordinated assassination of the emperor and all his known heirs. A pretender to the Ruby Throne of the Empire. Sometime after Titus Mede I captured the Imperial City in 4E 17, Eddar Olin led his army against him from the south. Titus routed Olin with a force of less than 2,000 men. Elante of Alinor was an Altmer archaeologist from Alinor in the late Third Era. She was a scholar of Daedric shrines, and authored a set of research notes. In 3E 427 Elante and her colleague Badama Andarys uncovered a Daedric ruin in a cave found along Vvardenfell's northern coastline in the Sheogorad region. This turned out to be the fabled Tomb of Mordrin Hanin. The expedition ended in disaster when their summonings failed to conjure anything more than scamps to aid their excavation and the Nerevarine looted the cave and tomb of treasure, killing Badama in the process. In 3E 433, Elante's research pointed her towards a cave along Cyrodiil's Gold Coast, which likely contained a Daedric shrine. She hired a new recruit from the Fighters Guild to help her navigate the cave and slay the many hostile Daedra who inhabited it. Elante discovered a lost shrine to Molag Bal deep inside the cave, which helped to further the understanding of Daedra. A little-known Jarl of Windhelm who lived in the Second Era. He was considered a cold-hearted ruler who cared little for the social inequity that was prevalent under his rule. The members of the "lower classes" of the city were subject to magical experimentation and assault by mages associated with Elgryr. The people, starving and desperate, eventually stormed the palace of "the unminded one". Elisif the Fair was the beloved wife of Torygg, High King of Skyrim, before his death at the beginning of the Stormcloak Rebellion. 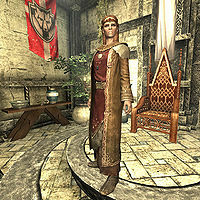 Following Torygg's death, she took his place as Jarl of Solitude, though the decision on who would assume the role of High King (or Queen) was delayed due to the outbreak of the rebellion. Elisif believed that the throne of Skyrim was her right, as High King Torygg's widow. However, she believed it best not to formally announce her intentions until the rebellion was quashed. She was a popular leader among her people, although some of her courtiers had concerns about her young age and inexperience, and believed she was under the thumb of General Tullius. Daughter of Emperor Uriel V, twin to Morihatha and half-sister to Uriel VI. Mother of Emperor Pelagius IV who was crowned in 3E 339 upon the assassination of Morihatha. Eloisa died of fever in 3E 335. Queen Elysana was the daughter of Queen Carolyna and King Eadwyre of Wayrest. Carolyna died in 3E 392, and a few years later, Eadwyre remarried. Queen Barenziah became Elysana's stepmother, and the princess gained elder step-siblings in Prince Helseth and Princess Morgiah. In the years prior to the Miracle of Peace, the princess became locked in a power struggle with her stepbrother for the throne. The law of succession favored Elysana, but Helseth was now the eldest, and he (and Barenziah) held much influence. While Elysana cultivated an air of innocent vapidity, in reality she had become as ruthless as the prince; among her allies was the influential noble Lord Woodborne, to whom she was betrothed—and who held the key to an artifact of immense power. This period saw the arrival of an Agent of the Emperor, sent to investigate the mysterious circumstances surrounding the death of King Lysandus of Daggerfall. The Agent was drawn into the siblings' machinations; Helseth hatched a scheme to blackmail Lord Castellian, head of the Elder Council, into changing the law of succession in his favor. Elysana retaliated by manipulating the same Agent into unwittingly helping her assassinate Lord Castellian. The princess later attempted to have the Agent assassinated as well, but this plan failed. Elysana's plans for the throne were dealt another blow when Lord Woodborne was exposed by the Emperor's Agent as Lysandus' murderer, and killed. However, when King Eadwyre finally died some years after the Warp in the West, Elysana emerged victorious. After ascending to the throne, the new queen banished Helseth and Barenziah from the court of Wayrest. By the close of the Third Era, Queen Elysana had borne two children by her new royal consort. The queen also forged an alliance with Wayrest's old enemies, the Orcs of Orsinium, and was considered by many contemporaries to be the most feared ruler in western Tamriel. "One land! One Emperor! Who among you will stand with me?" King Emeric of Wayrest was a member of the Cumberland Dynasty in the Second Era. His father, Earl Pierric, made sure he was schooled in both economics and military matters, and he served as a lieutenant escorting caravans during the summers. When he was twenty, in 2E 541, he helped fend off the onslaught of the Reachmen leader Durcorach when the latter began leading attacks against cities in High Rock. Emeric finally killed Durcorach outside Daggerfall. In 2E 563, the Knahaten Flu swept through High Rock, killing King Gardner and the entire royal family of Wayrest. Succession fell to Emeric, who ascended to the throne, beginning the Cumberland Dynasty. There was reportedly a "Halo of Gold" around the sun on the day of his coronation. He wed Princess Maraya of Sentinel three years later, greatly angering King Ranser of Shornhelm, who had desired Emeric to marry his daughter, leading to Ranser's War in Last Seed of that year. He wielded the Orichalc Scalpel when Ranser's army came to the gates of Wayrest, and Emeric's forces eventually succeeded in breaking their siege of his city. In the aftermath of the war, Emeric helped forge the Greater Daggerfall Covenant. Emeric was a strong advocate for an invasion of Cyrodiil in order to restore "the true flame of the Empire of Man". According to myth, he was an Orcish warrior, born in Normar Heights in present-day High Rock, who lived in the First Era before Orsinium was founded. He was the son of the Daedric Prince Malacath and an orcish maiden (presumably named Kayra) who was killed at childbirth. He was raised by the shaman of her tribe, the Grilikamaug. At the age of fifteen, after completing his tribe's rite of ascension, Emmeg spent the next two years performing many noble deeds throughout High Rock. Eventually Sheogorath tricked Malacath into killing his own son and took Emmeg's soul to his realm of Shivering Isles. A renowned mage whose writings were recorded in the Daedric language. Some of his work dealt with the magical generation of life. Middle son of Uriel Septim VII and Caula Voria. There were rumors that he and his brothers were actually doppelgangers placed in the palace by Jagar Tharn during the Imperial Simulacrum. He was murdered by Mythic Dawn agents at the age of 55, in a coordinated assassination of the emperor and all his known heirs. Ennon Decan was the founder of the Order of the Hour in the early in the life of the Second Empire, during the First Era. One of the oldest knightly orders in the Empire, they were dedicated to Akatosh, though originally it drew its members from the priesthood and military alike. Ennon built their headquarters, later known a Knightsgrave, in the Gold Coast region of Cyrodiil. He established chambers for training and meditation, places for prayer and contemplation, and even areas where the members of the Order could rest and relax. It was later discovered Ennon built the base atop an ancient cave that was believed to have been inhabited by members of the Alessian Order. When Ennon and his original group of companions died, great statues were raised in their memory. The Order continued operating out of Knightsgrave for nearly one hundred years before the organization disbanded. Enric Milres was a Second Era poet and writer. He authored the books The Alik'r and Sacred Witness. Although born in the Imperial City, he traveled widely across Tamriel and adopted the city of Sentinel as his home. While pursuing information to write about the Dark Brotherhood, he met the Night Mother herself, and was coerced into aiding their "despicable" acts. Years later, overcome by guilt, he published an account of the meeting, and was found murdered soon after. A member of the prestigious Gray-Mane family of Whiterun in and around 4E 201. He was married to Fralia, and they had three children, Avulstein, Olfina, and Thorald. The family sided with the Stormcloaks during Skyrim's civil war, and Thorald went missing while fighting the Imperials. Eorlund worked the famous Skyforge at the Jorrvaskr Mead Hall for the Companions, and was widely regarded as the best blacksmith in Skyrim. Ephen (also called S'ephen) was a Dunmer noble that was the center of a temple cult in the city-state of Mournhold, in the province of Morrowind. Ephen was given the purpose of guarding the Staff of Chaos. Ephrem Benirus was the Count of Anvil during the mid-Second Era. Under the rule of Emperor Leovic, he served as the Imperial Prefect of the city. After the Count of Kvatch, Varen Aquilarios, rebelled against the emperor, Benirus sent the Imperial forces stationed in Anvil to seize Varen's property and holdings. Varen's nephew, Carolus Aquilarios, repelled the attack after he rallied the single cohort of the Second Legion that Varen left in his command, as well as the Kvatch Warders. After numerous failed invasions against Kvatch, Anvil's defences were practically nonexistent. The pirate queen Fortunata ap Dugal exploited this weakness and quickly took control of the city with her crew. Count Benirus was deposed and paraded through the streets wearing a slave collar. Fortunata proclaimed herself Provincial Governor and took up residence in Anvil Castle. Items bearing Ephrem's image were ordered destroyed, and the docking fees he had set were more than doubled. In the Third Era, a large manor in Anvil bore his name. Located where the Anvil Repository once stood in the Second Era, Benirus Manor was owned and inhabited by Lorgren Benirus. King Eplear was an early ruler of the province of Valenwood and the founder of the long-lived Camoran Dynasty. The date for his founding of the dynasty is traditionally accepted as the earliest date in Tamriel's recorded history, 1E 0. While little is known about Eplear's life in detail, historians have suggested that it was Eplear who first united the wild ancestral Bosmer and created for Valenwood its first effective political identity, something that is called one of the "greatest military feats in Tamriel's history". He is also remembered as a benevolent, welcoming king who invited refugees from the troubled Ayleid Empire and elsewhere to live in Valenwood with the Bosmer. Specific details about how King Eplear died seem to be non-existent. Sage during the Third Era, around 3E 250. When the Council granted Andorak the High Rock kingdom of Shornhelm to end the war, Eraintine called it "Tiber Septim's heart beating no more", and wrote that the Camoran Usurper emerged "from out of a cimmerian nightmare". A diplomat in the service of Reman II, emissary to the Altmer (circa 1E 2820) and later the Bosmer. He was a prolific writer, with his largely negative impressions of both races quoted extensively in The Pocket Guide to the Empire, First Edition. Erlendr was a Nord warrior from the Second Era. He and four companions embarked on a quest to find Sovngarde. However, Erlendr, Hunroor, and Nikulas were betrayed by the wizard Grimkell, who turned them into stone pillars at Brodir Grove on Solstheim. They were avenged by Ulfgar the Unending, who killed the wizard. All of the friends eventually did find their way to Sovngarde. A High King of Skyrim who ruled from Solitude. Following his coronation, Erling was responsible for significantly expanding Solitude's defenses. Among his additions were the city's outer walls and gates, an extension to Castle Dour, and a bridge that connected the city's windmill with the Emperor's Tower of Castle Dour. These structures are noted to feature a more rounded style of architecture than the rest of the city in accordance with Erling's preferences. A living saint of Arkay in the late Third Era. Errandil served at the Great Chapel of Arkay in the city of Cheydinhal in Cyrodiil. He was a crusader against the practice of necromancy, and approved of Arch-Mage Hannibal Traven's stance on the Black Arts and its subsequent banning from the Mages Guild. Errandil was slain in 3E 433 by a contingent of Aurorans sent to desecrate the Chapel by Umaril the Unfeathered in his war against the Divines. The Chapel was saved from desecration by the Divine Crusader, but not before the saint's untimely death. A legendary warrior who took up the mantle of the Scarlet Judge during the Interregnum. She protected the people of Morrowind for over forty years before she was killed. She named Melar Sadus and her successor. Eshita was a Second Era queen of Pellitine. After the Thrassian Plague ravaged Elsweyr in 1E 2260 and destroyed 14 of the original 16 Khajiit kingdoms, Pellitine was the only state standing in the province besides Anequina. She co-founded the Kingdom of Elsweyr when she married Keirgo of Anequina in 2E 309. 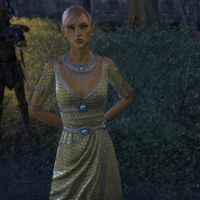 High Kinlady Estre Errinorne was the wife of Prince Naemon of Summerset Isle, sister-in-law of Queen Ayrenn, canonreeve of the city of Skywatch in Auridon, and the leader of the Veiled Heritance under the guise of the Veiled Queen. As leader of the Veiled Heritance, Estre sought to supplant Ayrenn, dissolve the Aldmeri Dominion, and expel all non-Altmer from the Summerset Isles. To achieve this goal, Estre and her faction employed a wide variety of terrorist methods, as well as employing the help of Mehrunes Dagon, and establishing a pact with the Maormer High Command, wherein the two factions would cooperate in the conquest of Auridon, of which Estre would become viceroy under Maormer suzerainty, although Estre had no intention of allowing this to come to pass. While it was known to Ayrenn that Estre was bitter for having lost the throne to her, Estre's identity as the Veiled Queen remained a closely guarded secret among the Veiled Heritance. As such, Ayrenn sought to smooth over relations with Estre by granting her a higher position in the Thalmor to placate her, and visited Estre in Skywatch to partake in a formal ceremony for this purpose. However, the ceremony was interrupted by an Eye of the Queen who disclosed Estre's true identity to Ayrenn, in Estre's presence. Estre herself promptly escaped by teleportation, and began to operate more overtly. After her escape, Estre made a bargain with Mehrunes Dagon promising her very soul in exchange for the support of his daedra to replace the now largely subdued Veiled Heritance. After sealing the bargain, she ventured to Dawnbreak, where the local canonreeve, Sinyon, continued to support her. Once there, she unleashed hordes of daedra on the town, largely leaving it in ruins and betraying Sinyon, before continuing north. Per her agreement with Mehrunes Dagon, she unleashed more daedra upon Torinaan, a holy site of the Eight Divines in the north, before reaching her ultimate target - the city of Firsthold. Here, she was let into the city by its ruler, High Kinlord Rilis XIII, who remained oblivious to her true nature. Once inside, she opened four Oblivion Gates across the city in order to besiege it with her daedric army and kidnap Rilis. Ultimately, she was killed in the attack and the Oblivion Gates were closed, but most of Firsthold was left in ruins as a result. As a result of her dealings with Mannimarco, Estre's soul was claimed by Molag Bal after her death and came to reside in Coldharbour. There, Estre was confined to the Cliffs of Failure, forced into a cycle of never-ending battle against others who failed to uphold bargains made with Molag Bal. Eventually, an adventurer arrived at the site and joined in the 'game' in an attempt to rescue a group of Mages Guild members who found themselves caught up in it. The game's organizer ordered the adventurer to pick a prisoner to ally with, Estre included among the choices. The adventurer proved successful and as a reward was allowed to choose between rescuing the mages or their chosen ally. What decision they made, and whether the adventurer even chose to align themselves with Estre is unknown. Etra of the Many Spears was a Naga hero of the Dead-Water tribe. According to tribal elders, his soul was older than the tribe itself and before he had even hatched his egg-minders could hear him crying out war-chants. In life, he was a fearsome warrior who was said to have felled great trees and slain huge beasts. After defeating other warriors, he would often eat their hearts or claim their grave-stakes as a trophy, which he would store in a large stone vault known as the Tomb of Many Spears. When a great Voriplasm claimed his vault, a furious Etra fought a great battle with it. Etra was ultimately killed and the vault became his tomb. Over the years, many Dead-Water kaals attempted to raid the tomb and claim a piece of Etra's remains to forge a mighty weapon, but they all ended in failure. In 2E 583, the Soulless One ventured into Etra's tomb and defeated the remains of the Naga warrior in order to recover his grave-stake and learn more about the Remnant of Argon. The Exalted Viper was a short-lived Celestial created in 2E 582. She was intended to replace the Serpent, and thus shared identical aspects. As a mortal, the Exalted Viper was an Imperial mage named Cassipia. When the constellations fell from the sky above Craglorn in 2E 582, the Serpent took form as a Celestial and began a cult called the Scaled Court. Attracted by his rhetorical goals of shedding corruption from the world, Cassipia left the Mages Guild and was appointed Regent of Serpentine Stratagems within the Court. However, she soon discovered that the Serpent's plans involved destroying civilization to restore Nirn to a primal state. Along with her Bosmer companion Little Leaf, Cassipia secretly defected from the Scaled Court and began plotting to usurp the Serpent's place in the sky by becoming a Celestial of equal power. Aided by Little Leaf and the Soulless One, Regent Cassipia used her authority to steal and disrupt the Court's research on nirncrux. She learned how the ancient Nedes first created Celestials and how the Court were creating mantikoras, as well as how the Iron Orcs were imbuing iron and flesh with nirncrux. Her efforts crippled the Serpent's attempt at raising an army in Upper Craglorn in the process, although her treachery went undiscovered and she retreated to Skyreach Temple with her followers to begin the transformation. Kelmen Locke, an old acquaintance of Cassipia's, attempted to dissuade her from performing the ritual, but instead was killed. His death brought the Thief's attention to her plans, and she journeyed to Skyreach Temple with the Soulless One to prevent the creation of the Exalted Viper. Although the ritual had been interrupted, the death of Little Leaf triggered Cassipia's transformation, and the Exalted Viper was born in battle. However, she was promptly slain in her mortal form. This page was last modified on 18 January 2019, at 16:17.